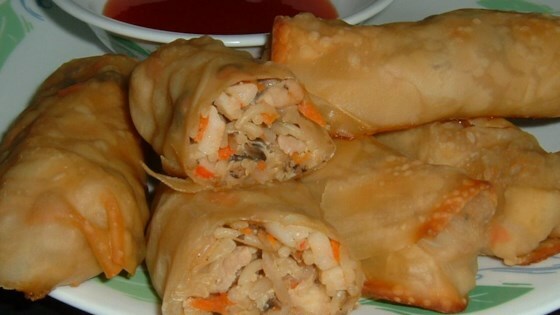 "These tasty spring rolls are packed with vegetables, seafood and pork. They contain a lot of ingredients but are worth the effort. Serve them with your favorite sauce. Some types of mushrooms may need to be soaked 2 to 3 hours before use. Ground turkey may be substituted for pork." Fry the spring rolls one or two at a time until golden brown, about 3 minutes. Drain on paper towels.